Your teeth are meant to last a lifetime. Years ago, diseased or injured teeth were usually pulled. But today, a tooth can often be saved through root canal therapy. Endodontics (en-do-DON-tics) is the branch of dentistry that specializes in treating diseases or injuries to the dental pulp. Endodontists are dentists that specialize in treating diseases of, or injuries to, dental pulp. Your dentist may refer you to an endodontist to perform your root canal procedure. The pulp is soft tissue inside the tooth that contains blood vessels and nerves. When the pulp becomes infected or inflamed, treatment is needed. All of these can allow bacteria to enter the pulp and cause infection and/or inflammation. 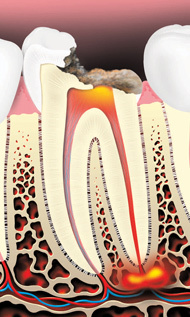 The infection or inflammation in the pulp can spread to the tissues around the root of the tooth. This can cause pain and swelling, but even if there is no pain, bacteria from the infection can damage the bone that holds the tooth in you jaw. Without a root canal, the infection and damage will continue and your tooth most likely will need to be removed. When a tooth is removed and not replaced, the teeth around it may shift. This can make it hard to bite, chew and clean your teeth. Areas in your mouth that are not cleaned well are more likely to have problems like decay or gum disease. Root canal therapy can prevent these problems by saving your natural tooth. Also, root canal therapy is usually less expensive than a replacement tooth. 1. Your tooth is numbed for your comfort. A thin, flexible sheet of latex or non-latex material called a rubber dam is placed over your tooth to keep it dry. An opening is made through the crown of the tooth into the pulp chamber. 2. 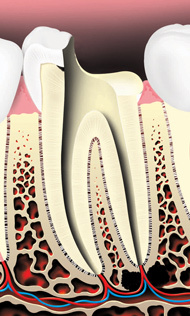 Your tooth's nerve or pulp is removed from the pulp chamber and the canal of each root of the tooth. 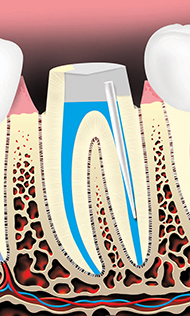 Each root canal is cleaned, shaped and disinfected so that it can be filled. 3. Your dentist may place medicine in the pulp chamber and root canal(s) to help treat the infection. 4. The treated root canals are filled with a rubber-like material to seal them. 5. 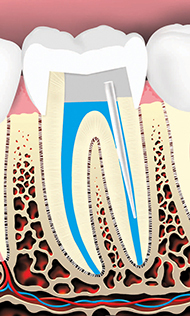 A temporary filling is placed in your tooth to prevent infection of the root canals. You may be given antibiotics if the infection has spread beyond the end of the root(s). 6. Finally, your dentist removes the temporary filling and restores the tooth with a crown or a permanent filling to strengthen it and improve the way it looks. If an endodontist performs the procedure, they usually recommend that you return to your general dentist for this step. It is very important to follow instructions from your dental team and to attend all of your follow-up appointments. Tooth decay can cause an abscessed (infected) tooth. The decay is removed and an opening is made into the pulp chamber. The pulp and nerve are removed, and the root canals inside the tooth are cleaned shaped, and disinfected. A metal rod (post) may be placed in the root canal to help retain the core (filling) material, which supports the restoration (crown). The crown of the tooth is then restored. If bone is lost due to infection at the root tip, this will heal over several months after the root canal is cleaned and sealed. When properly restored and maintained, a tooth with a root canal filling can last for many years. But, like any other tooth, it can become decayed or fractured or the tissue around it can get gum disease. Professional cleanings and regular dental exams will help keep your mouth healthy - whether you've had root canal therapy or not.